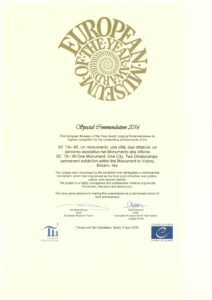 On April 9, 2016, BZ ’18-’45 was awarded a “special commendation” in the Council of Europe and European Museum Forum’s European Museum of the Year competition. The award specifies that it was granted for an “exhibition that reintegrates a controversial monument, which has long served as the focal point of battles over politics, culture, and regional identity. The project is a highly courageous and professional initiative to promote humanism, tolerance, and democracy.” For fully three years I had the pleasure of working with an excellent team on this complex and sensitive project: Andrea Di Michele, Hannes Obermair, Christine Roilo, Ugo Soragni, Silvia Spada, and, most especially, the designers Uli Prugger and Alfons Demetz, my friends from Gruppe Gut Gestaltung. But, beyond the labors of our team of scholars, designers, and curators, the award recognizes a longer and deeper process without which BZ ’18-’45 could not have moved forward in the successful ways it did: namely, a willingness within the city leadership and portions of the citizenry to undertake an honest, critically informed process of collective reflection and debate on the legacies of fascism and the region’s interwar history. The project’s title refers to the acronym for Bolzano (BZ) and the years extending from 1918 (the end of World War I) to 1945 (the end of the fascist dictatorship). Not a museum but a “documentation center” regarding this difficult period in the history of the Alto-Adige region, its site is beneath Marcello Piacentini’s (1926-1928) Monument to Victory. The monument in question builds on the legacies of 19th century monumental arches, updating and streamlining many of their standard features. 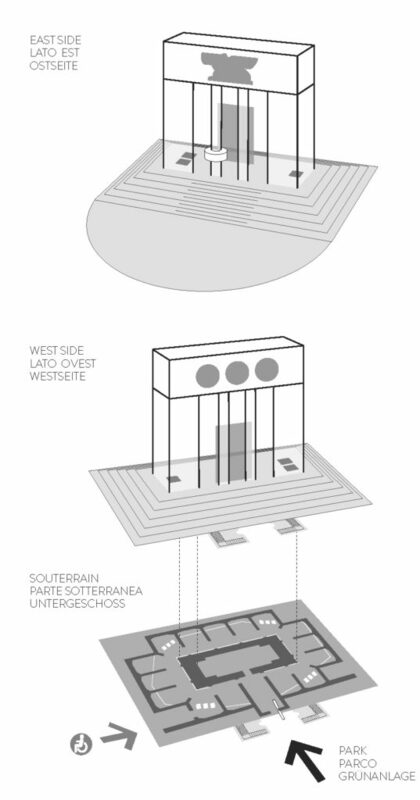 It is one of the very first fascist monuments developed in the so-called “lictorial style ” and was built to the specifications of Benito Mussolini. Monuments perform a wide array of functions in the history of civilization. They mark places that are deemed precious to the gods, the locations of major battles, and the tombs of monarchs, founders and leaders. They serve as sites of worship, commemoration and ritual. Once the instrument by means of which the powerful established their fame and wrote history in their own image, monuments have become increasingly democratized over the course of the modern era which, in turn, has fueled debates regarding their enduring value, legitimacy, and significance. Today monuments are built not just to generals and kings but to everyone from unnamed soldiers to ordinary citizens. The overall design of BZ ’18-’45, as well as programming related to its content, is documented at http://www.monumentoallavittoria.com/it.html. If you are visiting Bolzano, stop by; I suspect that you won’t be disappointed.